Good morning! Welcome to The Morning Shift, your roundup of the auto news you crave, all in one place every weekday morning. Here are the important stories you need to know until the machines take our keys away, then kill us all. According to Bill Ford, building a self-driving car is the easy part. The hard part is deciding what kind of effect the cars have on society, or specifically, who the autonomous car saves in an accident situation: its passengers, pedestrians or some other party. This is commonly known as the trolley problem. Figuring out an answer to that is the government’s job, Bill Ford thinks. “Ethics in the vehicle itself, i.e. does the vehicle make the decision to save you, the occupant, or to save 10 pedestrians if the right thing might be to hurt you the occupant. I feel like “fun” is a strange word to use in this situation. “...there are three-and-a-half million truck drivers, if you have autonomous trucks ... how about all the Uber drivers, the Lyfts, deliveries on FedEx and UPS? I suppose it’s no different than a conversation around artificial intelligence, but it’s all coming. It’s really hard to find a place or a forum or an institution that seems to be thinking through all these ramifications in a way that’s coherent and provides some answers. Sure, I guess, theoretically that’s what the government is ostensibly there for: helping the people. I say that with as little cynicism as I can muster. But for the government to be truly involved with autonomous cars, perhaps a good first step is to actually know what they are? It’s a mad scramble, among automakers and tech companies alike, to produce the first and best fully autonomous car. Mercedes is just one of many trying to reach the top. Daimler’s race to catch up is largely being run out of research centers in California and in Boeblingen, near its headquarters in Stuttgart. Christian Weiss, the head of autonomous driving, and Thao Dang, who leads the systems integration team, oversee daily tests on five V-Class vans, pushing them to the limit. The vehicles, packed with computer gear and sporting four sensors visible as yellow domes on the outside, search out tough traffic situations during rush hour. Automakers have traditionally enjoyed model years and cycles that extend to between five to ten years. The explosion of autonomous technology and how quickly it advances is pushing them to change their workflow. Speed is the name of the game here. We’ll see how everything shakes out. Remember nuTonomy? The AV designer who started testing self-driving cars in Boston in February and had some issues with the fahkcin’ seagulls? Well, now it’s working with Lyft for more testing and researching in Boston. Under the partnership, nuTonomy and Lyft will align their respective technology platforms to gather valuable research and insights into all aspects of ensuring a passenger’s comfort and safety during an AV ride – from routing and booking to the performance of the driving system and how it interacts and communicates with the rider. The collaborative R&D effort will take place in Boston, MA, where nuTonomy has been testing its self-driving electric cars since the beginning of the year. The tests are being conducted in Boston’s Raymond L. Flynn Marine Park and the adjacent Seaport and Fort Point neighborhoods. An engineer from nuTonomy rides in each of its vehicles during testing to observe system performance and assume control if needed. Last month, I made the claim that if you wanted to give an autonomous car a real test, you should bring it here, to New York City. Some of you disagreed and thought that they should bring the AHTANAMAS CAHS TO BAHSTON INSTEAD. And now they’re doing that. Happy? With the Model 3's launch date looming nearer and nearer, Tesla is reportedly looking to open up more stores in New York to cope with the demand. Now Assembly Democratic Majority Speaker Joe Morelle of Rochester has introduced a new bill, which still needs a sponsor in the Senate, in order for Tesla to open up to 20 stores in the state of New York. Currently, all 5 stores are located in the Greater New York City area or Long Island, but the new 20-store restriction would allow them to open locations upstate and support upcoming Model 3 buyers. Because oh, yeah, that’s right... there’s a whole other part of the state outside of this city. I almost forgot. Carvana is the used car company that first got your attention by selling cars from a massive vending machine. Some called it the “Amazon of used cars.” We called it a gimmick. And there seems to be some trouble brewing at the company, reports Bloomberg. Carvana’s burning cash at a pace that recalls the dotcom boom and bust. It has agreed to pass along most of any tax benefit generated in its initial public offering, estimated at the time of the listing at $1 billion, to early investors, including Carvana’s largest shareholder, Ernest Garcia II. And then there’s something investors didn’t learn from the prospectus for the New York Stock Exchange share offering: Garcia, who owns a controlling stake in Carvana and whose 34-year-old son Ernie III is its chief executive officer, has a criminal conviction tied to the savings-and-loan scandal that erupted in the early 1990s. Add to the fact that this is probably the worst time to buy a used car. The fancy vending machine draw might not be enough to keep Carvana afloat. 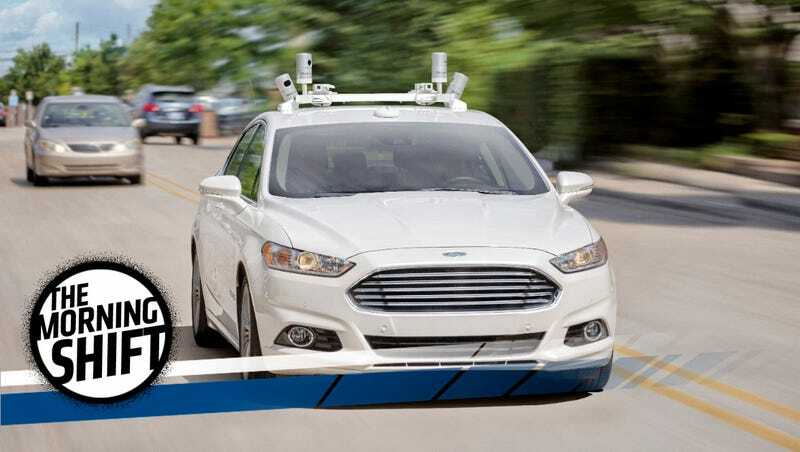 Neutral: Do you agree with Ford that the ethical responsibilities that come with self-driving cars should be allocated to the government and the government alone? Or should the automaker also have some responsibility as well?